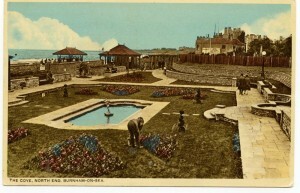 Opened as a developed seaside holiday attraction in 1927, this land had originally been recovered from dunes for public promenading by the developer of the nearby ‘Daviesville’ Spa. As part of his Spa development The Rev Davies had buttressed the dunes west and northward of the church yard with an inclined stone wall along the top of which was placed iron railings. The dunes had been levelled and grassed to provide an elevated walk. Davies allowed the public to promenade here and this continued until 1846 when it was closed possibly due to some abuse. Numerous indignant letters were written by people assuming it was public land. Part was later built on (Vicarage Terrace) the rest eventually became Marine Cove. Contrary to some opinions at the time there does not appear to be any evidence that this land had ever formed part of the church yard. Marine Cove originally formed part of the Old Vicarage Estate, but in 1926 the land was gifted to the urban district council and the ‘En Tout Cas’ Company was instructed to develop the land into a pleasure cove that would be enjoyed for years to come. 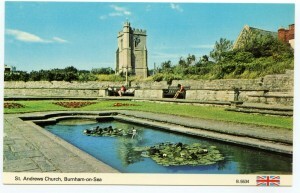 In 1927 the gardens were officially opened by J B Braithwaite who was an influential man of the time, having made several donations to the town. The style of the garden was influenced by Edwin Lutyens and Gertrude Jekyll. The cove has been refurbished in recent years and is now supported by a voluntary group of ‘friends’. Find out more in this interview with community gardener Jackie Strong. This short piece of archive film is from the Norman Gobey archive collection and was shot on 9.5mm.